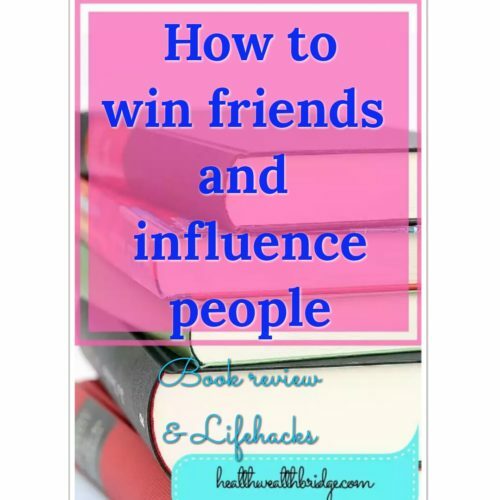 How to win friends and influence people is a life tools book. It’s 275 pages of people gold.Each word is worth memorizing. That’s why I am taking so much time to review this book,that too backward.This not a typical book review or summary .I am trying to highlight the parts which have helped me, become mentally stronger , more emotionally stable and get things done. Nobody at home or school really teaches us to deal beautifully with people.But all through life we need other people. Friends, family,colleagues ,people whom we dislike,and those who dislike us,all are important to get things done.You really don’t know . To get what you want,and leave the other person feeling great , is not an easy skill to develop. You spend time thinking how to make your hubby agree to the vacation plan.How to make your children eat up their veggies.How to make your boss agree to work from home. I struggle with this all the time.I have realized, other people’s wisdom can help us in this journey.That’s where this book is a gem. So how can you win people over to your way of thinking? Such an important skill,so few of us learn. If you have watched the movie Inception (starring Leonardo DiCaprio),you will know the power of thought planted in your brain. In reality too, your thought is all-powerful. If you want someone to do what you want,the idea has to come from his/her brain . No amount of forcing or cajoling can get it done, unless his/ her mind says so.Simple right? For all of us ,this is a job requiring lots of patience,sympathy and ingenuity.The second and third is easier to develop than the first.But all are equally important. To get the full benefit of Dale Carnegie ‘s wisdom, you have to read the book.But for those who want a shortcut,maybe I can help. ☆Dealing with people depends on sympathetic grasp of other person’s viewpoint. Other people may be totally wrong .But they don’t think so. It’s no use trying to condemn them we have to try to understand ,them because only wise tolerant exceptional people even try to do that. Try honestly thinking from the other person’s point of view. I would rather walk the sidewalk in front of a person’s office for 2 hours before an interview, than step into that office without a perfectly clear idea of what I was going to say and what that person from my knowledge of his or her interest and motives was likely to answer. ☆Learn from experience the enormous chemical value of sympathy in neutralizing the acid of hard feelings. ☆Be sympathetic with the other persons ideas and desires. ☆Appeal to the nobler motives. The way to get things done is to stimulate competition, the desire to excel, the challenge. Without a challenge most things will never get done . ☆All men have fears but the brave put down their fears and go forward sometimes to death but always to victory . ☆What every successful person loves is the game ,the chance of self expression to prove this word to excel to win . Have you read this book ,what’s your favourite part? Love this – it could be very useful in the blogging scene too. It is important to have a voice that will influence other people to become successful at blogging. This sounds like such a great book. Definitely one for the wishlist. Thanks for wonderful review!! I love reading books and it sounds like a great read!! Yes the book is great .Very glad you liked it. Definitely an important skill to learn! Getting the toddler to eat his veggies- you had me there! If we can be successful there- I’m in! I haven’t read the book yet! But I would love too (and only 275 pages). It seems so memorable and such great advice! Sounds like a good book to read. We all can use friendship tips. It never gets old! I haven’t read this book, but it is on my list. After reading your post I will have to download it onto my Kindle right away! How sweet of you to say this.Definitely post back here after you read it.Love to know what you thought.